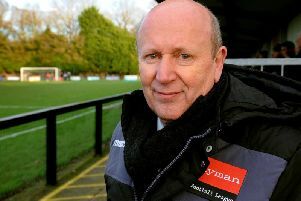 New Rustington manager Kerry Hardwell is looking to replicate the club’s remarkable double-winning campaign in his first season in senior management. Blues enjoyed one of their most successful seasons ever last time out, winning SCFL Division 2 and the Sussex Intermediate Cup titles, and only missing out a dream treble after losing to Bosham in the Division 2 Cup final. Jon Tucker decided to step down at the end of the double-winning campaign, with the club putting full faith in former player Hardwell to take charge. Hardwell will have Tucker working alongside him as assistant manager for the upcoming season and the new boss believes another double is possible. He said: “The plan is to replicate last season’s achievements. We’re trying to install a fresh new breed with younger players. Hardwell has assembled a squad that looks more than capable of competing on a number of fronts over the coming season. Prolific striker Josh Irish has arrived from division-higher Wick, midfielder Joseph Matthews, who has played at a higher level, is another to have joined. Other signings made by Hardwell include Jack Anderton, Oliver Chick, Ryan Spray and Owen Miles. The only two players to have left the club are retiring duo Gavin Heater and Ollie Rowland. Hardwell added: “Signing Josh is a big statement for the club as him and Steve (Kirkham) have the potential to score 50 goals between them this season. “New signings Joe (Matthews), Oliver and Jack are all under the age of 25 and have the potential to be great assets for the club this season and many to come. “Keeping club stalwarts like Alex (MacIver), Steve (Kirkham), Chris (Darwin), Gary (Peters), John (Beaney), Regan (Miles), Richard (John), Jack (Llewellyn) and skipper Ryan (Hudson) has been a massive positive for myself as I’m such a young manager. For them to have belief in me is a great platform for the season.